The Southern Photometric Local Universe Survey (S-PLUS) is mapping 9300 square degrees of the Southern sky with an optical 12-band narrow and broad band photometric system using a dedicated 0.8m telescope (T80S) at Cerro Tololo, Chile. The T80S telescope is equipped with an optical imager, the T80Cam, whose detector is a 9232 x 9216 10μmm-pixel array. The telescope plate scale at the detector is 0.55 arcsec/pixel and the FoV of the camera is 1.4 x 1.4 deg2. The CCD is read out with 16 amplifiers organized in an 8 x 2 array. The unique photometric system used for S-PLUS includes 5 Sloan-like filters and 7 narrow-band filters that cover prominent stellar spectral features: [OII], Ca H+K, Hδ, G-band, Mgb Triplet, Hα and the Ca Triplet, allowing determination of percent-level accurate photo-z's up to z ~ 0.3 (Molino et al., in prep.) and detailed element abundances for millions of sources. The S-PLUS main drives include the large-scale structure of the universe at low redshift, the star formation in and around nearby galaxies, quasar searches, transients and variable sources, searches for low-metallicity stars and Milky Way science in general. More details about the survey are available in the overview S-PLUS paper (Mendes de Oliveira et al. 2018). The first data release (DR1) contains 80 Stripe-82 fields observed during the scientific validation process, and regular data releases will be followed in the upcoming months. The total filter transmission curves, obtained by the convolution of the filter transmission curves with a model of the atmospheric transmission (using the ESO sky model calculator version 1.4.3), the efficiency of the CCD and the mirror reflectivity curves, are available on the project website. The Main Survey (MS): covering an area of ~8000 deg2 with a single visit to each field per filter, under photometric conditions and when the seeing ranges from 0.8’’ to 2.0”. The MS strategy is motivated by the requirements set by the extragalactic science, with accurate photometric redshifts for objects down to i=21 (Molino et al., in prep. ), allowing the study of the local large-scale structure, star formation rates and stellar populations. The Ultra-Short Survey (USS): covers the same area of the MS, in 12 bands, but with 5s exposures. The USS is motivated by the search for low-metallicity and carbon-enhanced stars. The USS is performed in gray non-photometric nights and bright time, under any seeing conditions. The Galactic Survey (GS): covers an area of 1300 deg2 in the Milky Way plane in all 12 filters including two Galactic regions, the bulge and the disk. The first epoch of the GS will have the MS depth, followed by shallow 2nd and 3rd epoch data having exposure times of 1 s and 5 s, respectively, and only using the filters r, i and F660. Finally, the GS will obtain at least 25 more epochs at random cadence and over many years, at the same depth as the first epoch observations. These various exposure times will probe a large range of magnitudes, allowing the sampling of different stellar populations while the temporal aspect of the survey is suitable to the detection of variable sources. The Marble Field Survey (MFS): composed by a set of specific fields that will be revisited as often as possible under dark or gray nights, and photometric or close-to-photometric weather conditions, when the seeing is too poor to observe MS, i.e. worse than 2’’. Objects selected for the MFS at the time of this writing are the Large and Small Magellanic Clouds (LMC and SMC), M83 (only in the narrow bands), the Dorado Group and the Hydra cluster. The MFS will primarily be suitable for identification and characterization of variable stars, studies of galaxies using techniques similar to low-resolution IFU observations, and the detection of stellar and gas halos or streams out to several effective radii around nearby galaxies. The Variability Fields Survey (VFS): will perform observations with exposure times to be determined, repeated with a cadence that is set by the frequency of non-photometric nights, covering a number of fields already observed by MS. The exact strategy for the VFS is still not set, given that proposals for the use of VFS are still to be received by the team. The VFS may be suitable to detect variable sources, such as pulsating stars, cataclysmic variables, supernovae (SNe), eclipsing binaries, asteroids, AGNs, and to find and do follow-up of targets of opportunity. As explained in Mendes de Oliveira+2018, the procedure adopted in S-PLUS for the catalog production is similar to that thoroughly explained in Molino+14 for the ALHAMBRA survey (Moles et al, 2008). The S-PLUS photometric pipeline is based on the SExtractor software. Photometric catalogs are constructed in double-image mode to perform multi-band aperture-matched photometry. Detection images are created as a weighted-combination of the reddest (griz) broad-band filters to maximize the detectability of faint (or low-surface brightness) sources and to enhance the definition of the photometric apertures. An empirical noise characterization is done beforehand on an image-by-image basis, to account for correlations among adjacent pixels during image reduction process (Molino+14). Magnitudes for non-detected sources on individual images are set to m=99. and corresponding uncertainties replaced by upper-limits. Photometric zero-point calibrations have been performed for every pointing using a novel technique optimized for wide-field multi-band photometric surveys (Sampedro et al, in prep.). The technique uses a combination of libraries of stellar models and the stellar locus of main sequence stars, applied to typically ~1500 stars per field, bringing all zero-points to a typical error of 1-2%. 128: A memory overflow occurred during the extraction. Objects with a different flag's number may suffer from a combination of the already mentioned flags, being the number the sum of the different flags. The catalog contains a triple photometry where magnitudes (& uncertainties) are named according to the filter's name and the adopted photometric aperture. Here we provide an example for clarifications: F660_auto, F660_petro & F660_aper correspond to the AB magnitudes for the F660 narrow-band filter, where “auto” refers to the total (restricted) apertures used to derive photo-z estimations, “petro” to the total (moderate) apertures used to derive absolute magnitudes and stellar masses and “aper” to the standard circular 3”-diameter apertures (see Molino+16, Molino+18, for more information). Photometric uncertainties take the same name (as magnitudes) but adding the prefix “d”): “dF660_auto”, “dF660_petro” & “dF660_aper”. An estimate of the signal-to-noise for every detection, within each one of the three apertures, is also provided as “s2n_F660_auto”, “s2n_F660_petro” & “s2n_F660_aper”, defined as explained before for the detection image. For each sets of magnitudes, photometric uncertainties are empirically corrected in all the 12 bands. Whenever a source was not detected, its magnitude was set to 99. and its photometric uncertainty replaced by a 2-σ upper limit. Magnitudes are corrected from galactic extinction using Schlegel+98. The catalog also includes a photometric redshift estimate for every source using a new version of the BPZ code (Benítez 2000) optimized for galaxies in the local Universe (Molino et al, in prep.). “zb” correspond to the most likely value (i.e., peak) and “zb_Min” and “zb_Max” represent the lower and upper limits for the first peak within a 1σ interval (i.e., ∆z = 0.02x(1 + z). Based on the most likely redshift, a spectral-type classification is also provided by “Tb”, where its number refers to the selected template. “Odds” gives the amount of redshift probability enclosed around the main peak and “χ2” the reduced chi-squared from the comparison between observed and predicted fluxes according to the selected template and redshift. An estimation of the stellar-mass content (in units of log10(M⊙)) is given by “Stell_Mass”. 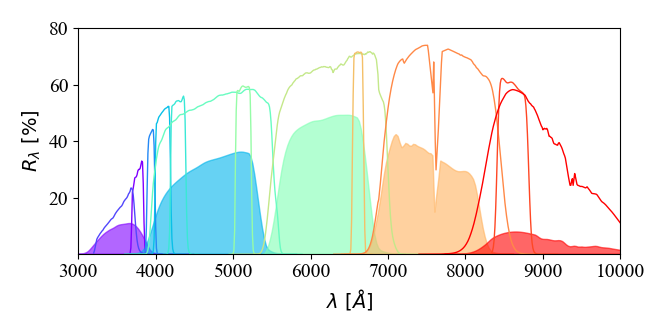 Absolute magnitudes in the Johnson B-band (“M_B”) are estimated for each detection according to its most likely redshift and spectral-type. The raw imaging data of S-PLUS are processed daily and data catalogs are generated at the data center, located in the T80-South technical room, on Cerro Tololo, Chile. The S-PLUS raw data are reduced using a version of the same data processing pipeline jype that is used to process data for the J-PLUS and the J-PAS surveys, and it is based on the photometric pipeline originally developed for the ALHAMBRA survey (see Cristobal-Hornillos et al. 2009; Molino et al. 2014; Benitez et al. 2014) and the CLASH surveys (Molino et al. 2017). combining the individual frames into the final astrometrically-aligned images. Bias frames are obtained every night and twilight flats are obtained whenever the sky is clear, at dawn and at dusk. Twilight flats work well for our purposes. Bias and twilight flat fields are stable over a period of about a month and therefore master bias and master flats are obtained for such a period, encompassing the observations of the object. Master flats are obtained for each filter. Only flat fields with counts between 8000 and 45000 counts are used. Overscan subtraction, trimming and bias subtraction is applied to each individual flat field. Master flats are then created by obtaining, for each pixel, the median value with 3 sigma clipping, of all usable flats of a given filter, after scaling each image by its mode. This is performed using the task imcombine of iraf with options median, sigclip, scale=mode and zero=none. Finally the master-flats are normalized to have a median of unity. The reduction of individual images consists of applying the overscan subtraction, trimming, bias subtraction and masterflat division. Then cosmetic corrections (removing satellite tracks and cosmic rays) and fringing subtraction is performed. Satellite track and cosmic ray subtraction is performed using either SatDetect in the first case and LACosmic (van Dokkum 2001) or retina filter in the second case, both from SExtractor. Fringing frames are obtained by combining the final individual frames that suffer from fringing, usually only in the z filter. The fringing patterns are stable over several months, so a single fringing frame is made by combining all images over such a period which do not have any bright objects. The last step is, then, the combination of the individual images, which is done by obtaining the median, with 3 sigma clipping, pixel by pixel, for typically three images of each field and filter. This is performed using the task imcombine of iraf with options median, sigclip, scale=none and zero=mode.